Update: The insanity continues. The release from Cannonsville will be raised today beginning at 9 am (after being dropped last night). Despite press releases about “good neighbors”There is absolutely no consideration given for the down stream users or the river habitat below the dam. And the East Branch is still starving for water with Pepacton at 68.6% capacity. After increasing the Cannonsville release slightly over the last few days it has now been cut back to 280 cfs this morning. The flow at Hale Eddy is 359 and dropping this morning but should level off by mid morning. 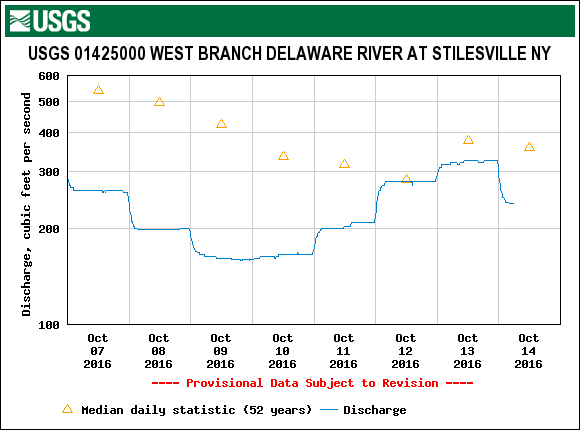 The Upper Delaware Wild and Scenic Creek flow at Lordville will fall and level out later in the day. Once they are done dropping Lake Wallenpaupack and get past the whitewater releases from Rio Reservoir we expect the release up here to increase. Hopefully that happens soon so the Mainstem riverbed will actually be covered with water. Temperatures are not an issue and we are coming off a cool night that was down in the 30’s. The river did fish well yesterday with decent olive hatches in the afternoon. Definitely carry isonychias, cahill spinners, and caddis patterns too. Nymphing and swinging wet flies should work well until the afternoon hatches begin. Today should be clear with winds below 10 mph. The air temps will be in the upper 50’s. Tan Caddis – #16 – 20 – Hydropsyche spp. Little Black Caddis #18 – 20 – Chimarra sp.